Are you starting a mobile marketing campaign, or do you plan to increase your budget? If yes, we have the stats to show you that you are doing the right thing for your business. Small business owners should ride the trend of mobile marketing to gain a competitive edge. To help you develop your strategy, we put together a list of mobile marketing statistics that you should know. 1. How much are US companies spending on mobile advertising? A research revealed that mobile ad spend will exceed $40 billion this year. It is also estimated that mobile ad spend will exceed $65 billion by 2020. 2. How much time do consumers spend on mobile devices per day? 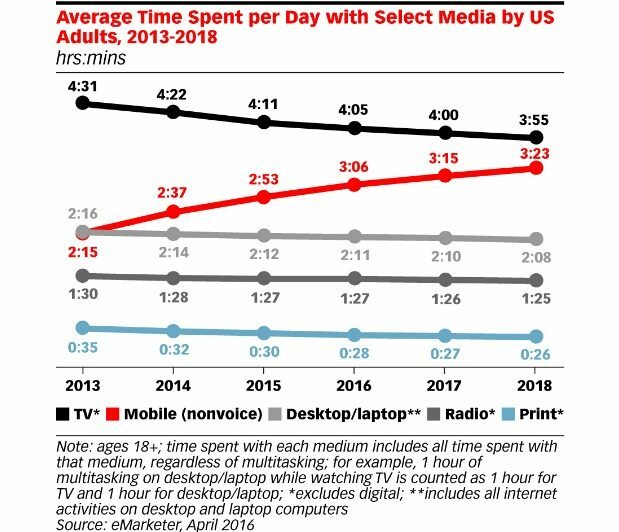 US adults spend 3 hours and 15 minutes per day on mobile devices, and that number is expected to increase to 3 hours and 23 minutes in 2018. 3. What percentage of small businesses have a mobile friendly website? Only 5 percent of small businesses run a mobile-friendly website. 4. What percent of small businesses have mobile apps? 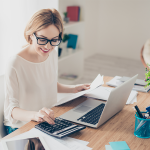 42 percent of small businesses have a mobile app, but that number is predicted to go up to 67 percent by the end of 2017. 5. Which industries are the most searched for on mobile devices? Food and beverage top the list at 73 percent, followed by Health and Sports both at 68 percent. 6. 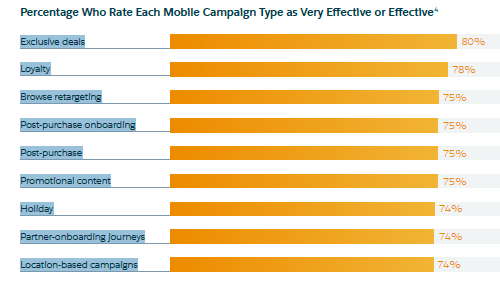 What are the most effective mobile marketing campaigns? Marketers claim that extending exclusive deals and offering loyalty programs are the most effective mobile campaigns. However, they also find other campaigns effective or very effective. 7. Should small business retailers consider sending offers to mobile devices while consumers shop in store? Yes. 86 percent of consumers would find it beneficial to get exclusive coupons or offers on their mobile device while shopping in store. 8. What is location-based marketing, and do marketers find this method important? Location-based marketing is a strategy that involves targeting mobile users within a certain area with ads such as text messages, banner ads, or paid search ads. 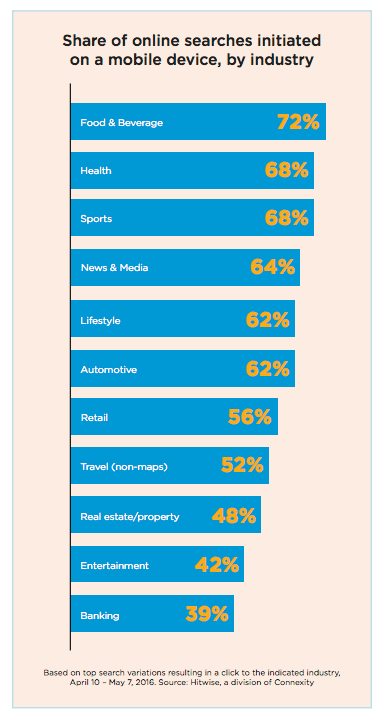 For 3 out of 4 marketers, location-based marketing is important to their business strategy. 9. How effective is location-based marketing? It appears to be very effective as location-based marketing techniques can be 20 times more effective in generating returns than usual banner ads. 10. Do personalized coupons persuade mobile shoppers to buy more? Personalized coupons might make the difference. Nearly 4 out 10 mobile shoppers say that they’ll spend more if they get a personalized coupon. 11. 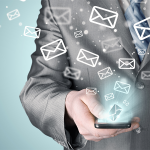 Should small businesses consider optimizing email campaigns for mobile devices? Yes, they should because their competitors are most likely doing it. Around 7 out of 10 respondents claimed that email optimization for mobile is part of their email marketing strategy. 12. 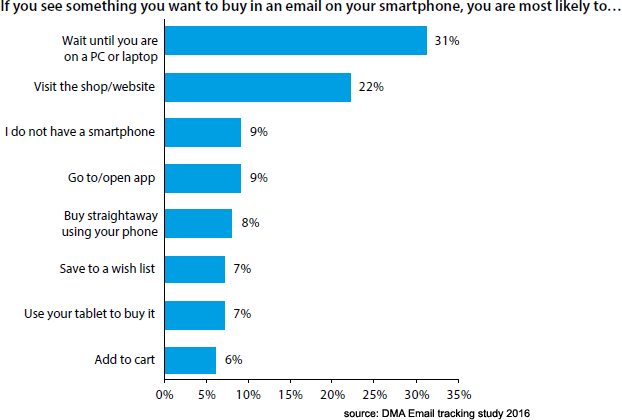 What do consumers do when they see something they want to buy in an email on their smartphone? 13. What is the average order value (AOV) of shoppers using mobile devices? The AOV for smartphones overall stands at $89. iOS users have an AOV of $114, topping Android users with an AOV of $95. 14. 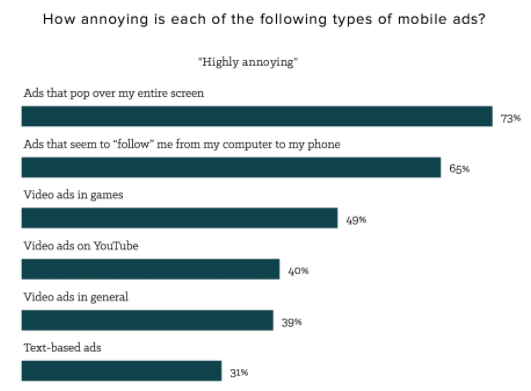 What types of mobile ads annoy users? 15. What is the average page load speed on mobile devices? On average, mobile sites take 22 seconds to load. 16. What load speeds do consumers expect from mobile sites? Half of consumers expect a mobile page to load in less than two seconds. 17. Do people spend the same amount of money when using mobile apps and mobile web? No, because online shoppers spend 6 percent more money on apps and 5 percent less money on mobile-friendly sites each month. 18. What is the expected mobile app revenue by the end of 2017? Mobile apps are expected to generate a total of $77 billion in 2017, fueled by 197 billion mobile app downloads. 19. 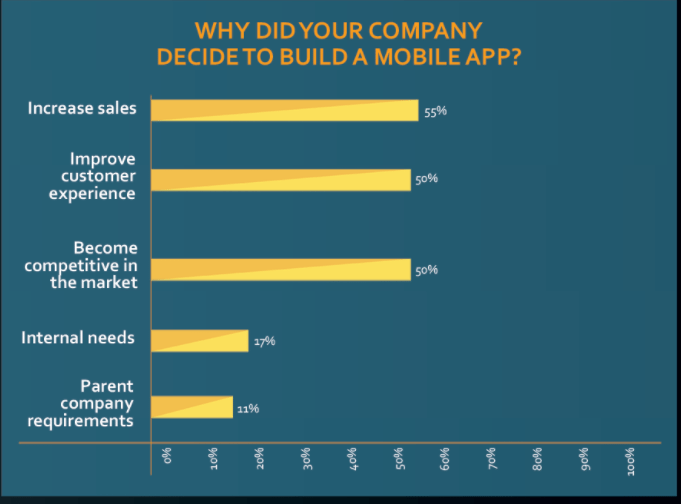 What are the top reasons why companies build mobile apps? Companies primarily build mobile apps to increase sales, improve customer experience, and compete better in the market. 20. Do people spend more time watching videos on mobile device as opposed to other devices? Yes, since 2016 people have spent more time watching videos on mobile compared to desktop. It’s estimated that people will spend 36 minutes each day viewing online videos on mobile as opposed to 18.5 minutes on non-mobile devices. 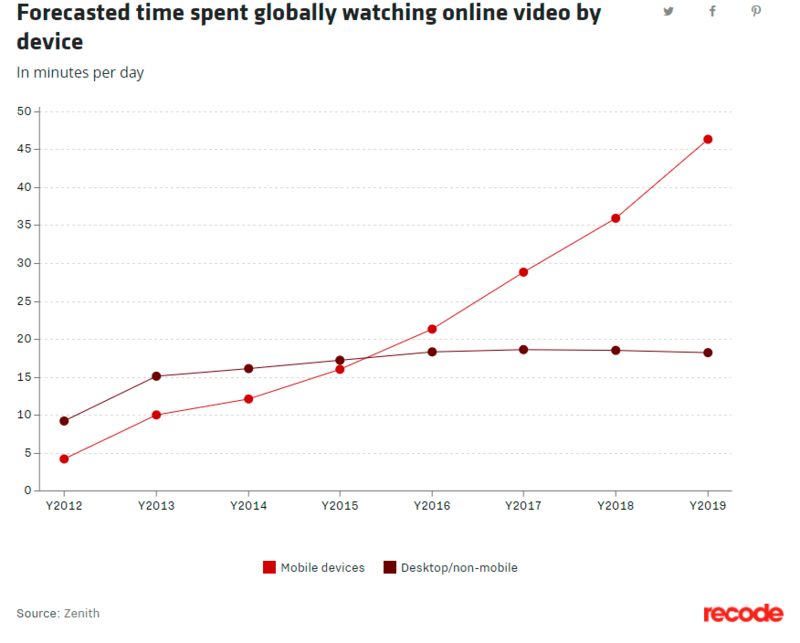 People are spending more time watching videos on mobile devices than other devices. The buzz behind mobile marketing is driven by numbers. We hope that our compilation of mobile marketing statistics has convinced you to jump on the bandwagon and develop a strategy using mobile marketing tactics. Do you have other interesting mobile marketing stats? Feel free to share them in the comments section. Henry Kanapi is a staff writer for Fit Small Business specializing in business and e-commerce. Henry ran small businesses while working as an editor for a small business/motivational website before joining the Fit Small Business team. When not writing, he's busy organizing poetry slam events or playing basketball. Thanks Henry for sharing insights for realistic ways to monetize a blog. Let’s keep spreading the word about the value of Marketing. they have deep immersive knowledge about their audience -that brands or startup companies could pay for.